Click here for Result of Recruitment Test held on 23.9.2018. 1. Cancellation of Mega Housing Project of M/s Omaxe limited at Village Mehmadpur, Tehsil Rajpura, Distt. Patiala. 3. Public Notice regarding rehdi booth 323 Phase 3b1. 4. Public Notice Regarding Charge Sheet. 5. Alottees of PUDA Enclave,Fazilka & Baba Farid University, Faridkot. Provisional Seniority List department of Town and Country Planning (Submit any suggestion/objection on ctppunjab@gmail.com). List of Beneficiaries Under Beneficiary Led Construction (BLC) component Scheme of PMAY-HFA. Earlier Punjab Urban Development Authority (PUDA) draw Residential Plots Rajpura Colony results 172 allotment will declare online officially on 08.10.2015 (Thursday) at 11.00 am onward at web portal puda.gov.in. There are 172 residential plots at Rajpura Colony near bus stand, Patiala and last date to submit application form is 10 August 2015. Every year Punjab Urban Development Authority (PUDA) launches residential schemes for all categories. All successful applicants done registrations are eligible to take part in PUDA draw. In this page we will give you direct link which will show you PUDA Results of all latest draws. rojgarresultcard.com is 1st to provide official result link for PUDA 118-119, SAS Mohali results. How Check PUDA Draw House Results? PUDA Results 2016 – 309 Plots Nabha Residential Scheme Results: Punjab Urban Development Authority (PUDA) draw Nabha residential plots results will flash officially online from 28 June 2016 onward at site puda.nic.in. There are 309 residential plots and venue of draw is Community Centre, Urban Estate, Pharse III, Patiala. The draw of allocation of 309 plots at nabha road, patiala was taken out on 22.01.2016 and letters of intent (loi) were issued to successful applicants. Applicants who are in search for puda Nabha residential scheme results can view from link provided here. PUDA Results 2016 – 172 Residential Plots Rajpura Colony, Patiala Scheme Results: Punjab Urban Development Authority (PUDA) results for allotment of plot numbers at Rajpura Colony, Patiala residential plots draw going to announce public online today i.e. on 21 June 2016 at 11.00 am onward officially website www.puda.nic.in also on gmada.gov.in. The draw for allotment of plot numbers to the LOI (letter of intent) holders of 172 residential plots held on 08.10.2015 and letter of intent issued to successful applicants. Applicants who are in search for puda rajpura colony patiala housing scheme results can view from link given here.……………. Any error/ ommission/ objection in the list of applicants status will brought in to notice of estate officer on or before Monday i.e. 15 June 2015. 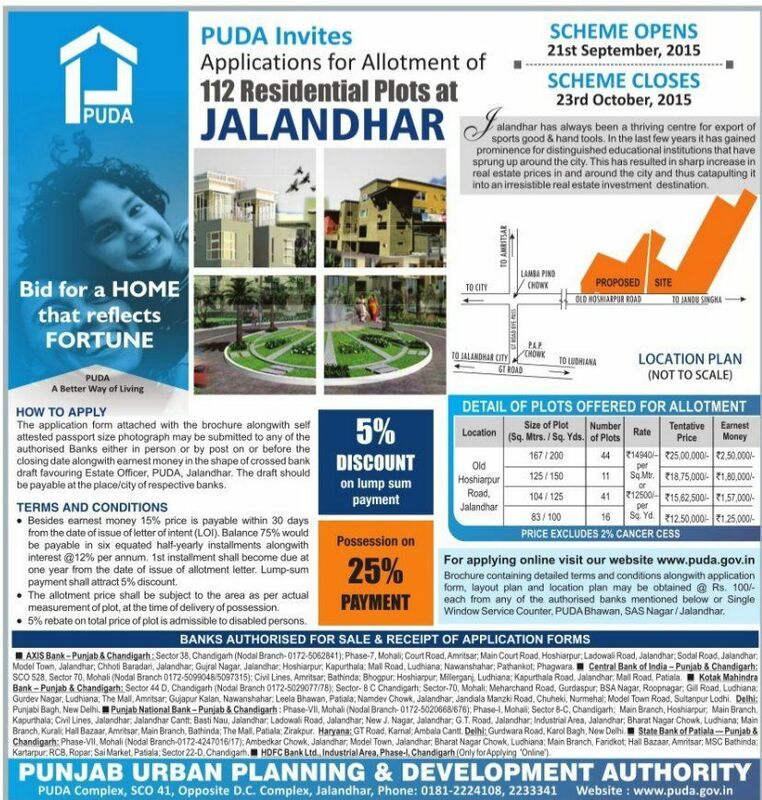 PUDA Residential Plots 2015 Notice: Punjab Urban Development Authority (PUDA) invites applications for 112 residential plots allotment at Jalandhar. 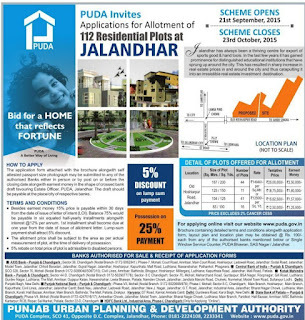 The puda jalandhar scheme opens on 21 September 2015 and last date to apply online is 23 October 2015. The broad cast advertisement is published at puda.nic.in and there are plots of 167/200 12/150, 104/125, 83/100 sizes in sq meters/ yards. More information of PUDA Housing Scheme 2015 regarding fees, allotment and application process etc is mentioned below……………. There is also discount of 5% on lump sum payment and possession on 25% payment.